I think there’s too many white backgrounds on the web – there, i’ve said it. (yes, i know this site is bright, but it may be changing design slightly, soon) But If you have a headache, or maybe it’s late at night, or both, do you really think it’s healthy to be staring in to a light for hours on end ? – i don’t, because I get migraines and some photophobia, of course, if i have a migraine, the computers and radios are switched off and i go away.. so, i am careful to my eyes and i don’t stare into lights unnecessarily, even when i have no headache. Pity then, that most websites are dark text on a light background. I understand the idea of skeumorphism where it seems this idea comes from, as throughout history, printing is just dark ink on dried pulp, so i imagine it was decided this makes sense on electronic displays too. I disagree. To add to my ‘problem’, I’m a night owl too, so I’m often up late, typing away – but at 3AM i’m not sat here with full house-lights switched on, it would make no sense. So what to do ? every site is different and that’s a problem … or is it ? I’ll be discussing Firefox here, because that’s the most popular browser and is cross-platform, although similar add-ons can be found for other browsers, and Stylish is available for other browsers too. First up, is a Firefox Add-on called No Squint .. i shan’t go into much detail about the add-ons themselves, but this lets you adjust the page zoom on Firefox, which is kind of redundant, because Firefox already has zoom + and – toolbar buttons – it’s just that they’re not enabled by default. NoSquint does however, let you customise text and background colour, on either a site-by-site basis, or on all sites globally, which may be all that you want or need.. and NoSquint‘s default zoom level is 120% anyway, globally, so there will be less wasted space on your widescreen monitor.. as many sites still have a thin paragraph of content in the middle of the screen – and wasted space either side, just in case we’re all still using an old 4:3 800 x 600 CRT monitor from years ago..
Next up is Stylish – it doesn’t do anything on it’s own, but it allows for much more fun and customisation than Nosquint does ! It’s main job is website customisation, There are hundreds of styles for the most popular sites, tweaks and fixes that other people have shared, but the less popular sites will have had nobody creating specific styles for them, so use ‘Global styles’ for all remaining websites, some styles just work on just one site, other styles change every site. If you like this idea, I’m typing this using a global style called Midnight Surfing which can be found (like many more) at Stylish’s user-submitted styles site User Styles.org so have a look to see what sites they have.. some hide Youtube comments, or remove the ads on Facebook and that chat box and all that other nonsense, of course some styles don’t work perfectly – and some styles may work, but hide pictures or parts of the site you do use, and you have option to preview them before you apply them anyway. Lets go through finding a dark global theme for Stylish. As you see, I like my Firefox with the classic layout, add-on bar at the bottom, which is where i placed the Stylish ” S ” icon. by default it will likely be up at the top-right corner on the Firefox toolbar. 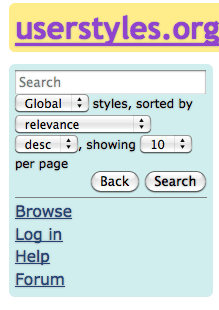 whatever webpage you are on, to search for some styles for it, simply click the icon and select ‘Find New Styles for this site’ Easy huh ? the Userstyles website will open and you can scroll through and see which sites suit you, and work well. 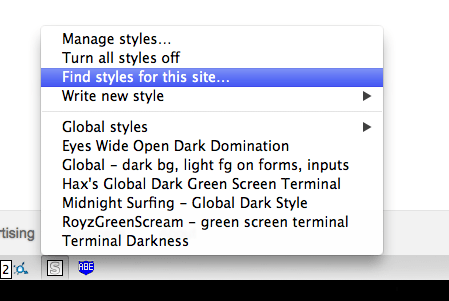 if you want global styles – click ‘advanced’ and select ‘global’ and if you were looking for dark global themes, that’s where you need to search. I always install the Safari Font Rendering style too, for when i’m using light backgrounds, because Firefox’s font rendering on all three major platforms is still poor, this style invokes either anti-aliasing or more likely, sub-pixel hinting. Another highly recommended dark style is MyFavolors which seems to be a good one too. there are hundreds more. 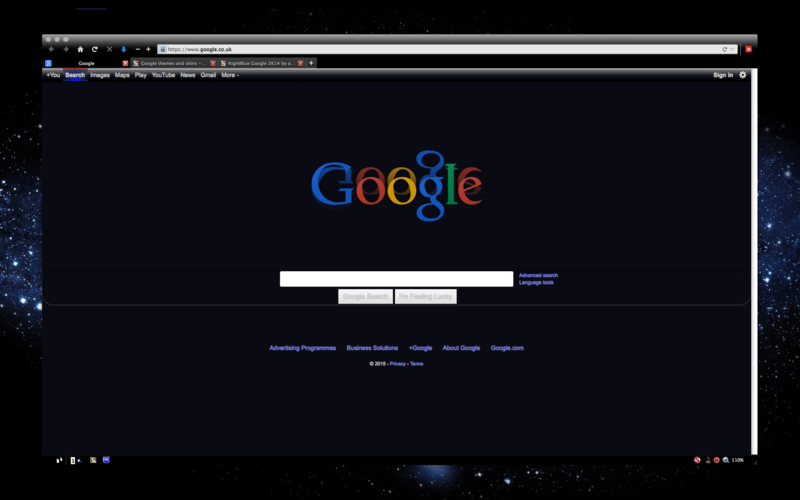 So Far, so good.. you even installed a dark theme in Firefox too ? good. I even found a Yaesu FT 920 Firefox theme (my main HF rig) but now, i can’t see what i’m typing. Why are backlit keyboards not standard on all computers by now ? all cellphones since about 1985 have, but we are behind the times already with this, many (outrageously expensive) Amateur radio sets still do not have illuminated buttons. it’s 2015, and Yaesu, Icom and Kenwood are still fobbing Hams off with backwards tech, (who mentioned FDMA) – thank goodness for the likes of Motorola where i dont have to switch a lamp or torch on to change frequency or find a button ! The same goes with computers, or any electronic device nowadays, everthing has buttons now.. or is it only ‘PC Gamers’ who use their PCs in low light levels, because most illuminated keyboards are trash, and they look trashy too, or are some juvenile design, like Darth Vader’s sunday best helmet… or something..
To see my keyboard in low light, I bought a Apple Macbook Pro 15″ not because I’m a fanboi, I’m REALLY NOT, but because it’s got a proper, high quality backlit keyboard, and the thing is made of metal, not cheap black plastic, where you need a torch or keyboard lamp if typing at night.. forget buying those long flexible gooseneck USB LED lights too – they stress your USB socket and will make your laptop require repair eventually. 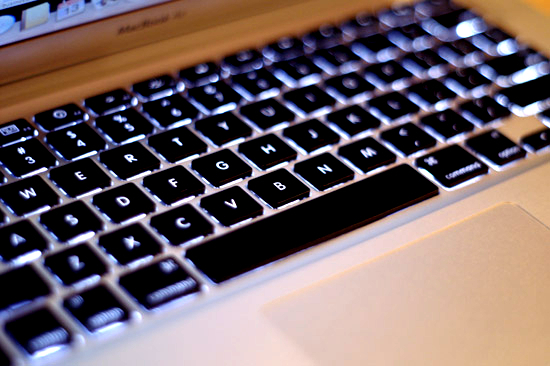 isn’t it time accessibility was extended to keyboards on PCs and Amateur Radio Gear ? Here’s an example – a Dark Google… so why buy sunglasses or headache pills ?